Relocating to a quaint, old-fashioned country home is a dream come true for many people. Yet, while the property may look fantastic from the outside, you may find that on the inside it is lacking some of the modern features that have become an essential part of 21st century living. Bringing an old country property into the modern age may seem like a daunting prospect, but the process is often easier than you might think. 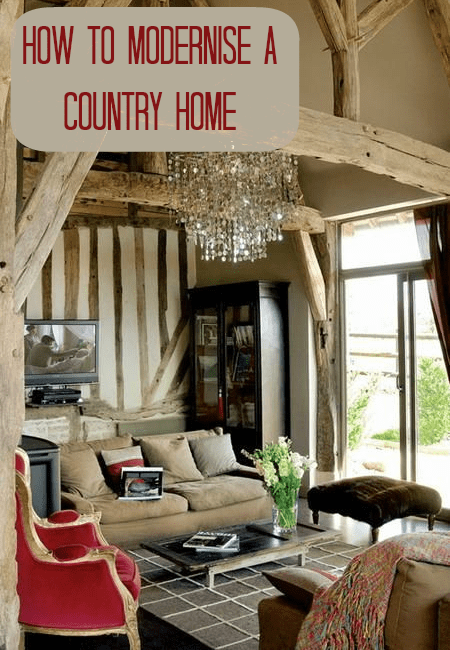 Here are some top tips on how you can ensure a country home comes into the 21st century. Modern properties are based on light colours that provide a clean, spacious and airy feel, so if you’re planning on redecorating it’s important to ensure you use pale colours for the walls. Opting for light colours provides a perfect contrast that will allow furnishings and other decorative items to really stand out and make a striking impression. If you’re moving into an old property there’s a good chance it will contain curtains that have seen better days. Replacing these with blinds is an easy way to give the house a more modern feel and can help to create the airy and spacious style mentioned above. Getting any windows double glazed is also advisable as a means of keeping the property warm and blocking out any outside noise. Installing new kitchen features and appliances is another good method of bringing a home into the 21st century. Replacing old laminate worktops with marble or granite can give the room a new lease of life, while you will also want to install any modern appliances that could be missing, such as a dishwasher. One essential that any modern home can’t do without is a reliable internet connection. Whether it’s for shopping, entertainment, education or work, being online has become an essential part of many people’s everyday life. However, receiving a fast and reliable rural broadband service can prove difficult, as the necessary infrastructure is often lacking. One way to get around this is by switching to satellite broadband, which connects to the web via signals sent from a satellite in space, meaning infrastructure is not an issue. Installation only requires the fitting of a small satellite dish, which can be attached out of sight to the back of the property, and a modem. If you’d like to learn more about this technology contact Avonline. Another easy way to modernise a country home is to replace the flooring. Many older properties have carpeted floors and swapping this for wooden flooring is a perfect way to give your home a 21st century feel. If you think a wooden floor can make a room look a little sparse, why not add a few modern, stylish rugs? One part of the property that may also need updating is the garden. This is probably the hardest part of the modernisation process as it often requires some serious hard work, as well as ongoing maintenance afterwards. However, if the end result is a beautiful garden in which you’ll love spending time, the effort will have been worthwhile. A good way to give a garden a modern feel is by installing ambient lighting, which can really help to set the mood when you’re spending time outside. This featured article comes on behalf of James Martin. James is a professional content writer who has spent five years writing across various subjects, namely property as well as the trials and pleasantries of life in the countryside.